OC Remix recreates the entire soundtrack to Capcom's modern classic. I don't particularly care for the Mega Man series. It's abusive and unforgiving, so I steer clear. I can't deny the excellence of its iconic music, though. The original 8-bit jams kept me from throwing my controller at a cat while playing Mega Man 9. I like to think this is why the music buffs at OC Remix, a website dedicated to independent covers of videogame tunes, chose it as their latest collaborative effort. Back in Blue is a series of original compositions inspired by the "modern classic." That is to say, 14 musicians got together and recreated the entire soundtrack as a loud, pounding electronica collection. The hour-long tribute to the Blue Bomber is available online as a free download -- a frequent and fortuitous consequence of OC Remix's independent, unendorsed album releases. As the 18 tracks move from one world stage and boss fight theme to the next, bits of other genres or musical styles start creeping through the thumping bass. Notable highlights include a moaning man, xylophone, flute and, of course, a ukulele. 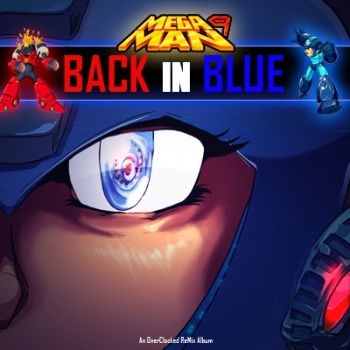 The oddball mix of music doesn't exactly scream dystopian robotic future, but the familiar remixes are decidedly Mega Man.